The 21-year-old was happy to finish strongly. 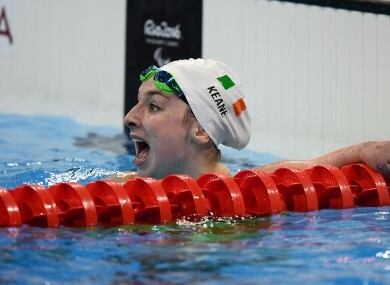 ELLEN KEANE’S MEDAL-WINNING Paralympics ended with an eighth-placed finish in the final of the 100m backstroke. The 21-year-old, who won a brilliant bronze in the pool on Wednesday, swam a slower race than this morning’s heat but she admitted afterwards that a busy week had taken its toll. Keane started strongly in at the Olympic Aquatics Stadium but faded quickly in Lane 1 to clock a time of 1:16.27. Australia’s Ellie Cole, the defending champion, won gold while silver and bronze went to Nuria Marques and Hannah Aspden of Spain and the USA respectively. Meanwhile, Nicole Turner has been forced to withdraw from tomorrow’s S6 100m freestyle heats on medical advice. The 14-year-old qualified for five finals from as many events in her first Games but won’t compete on Saturday. Email “'Exhausted' Keane finishes with another final as Nicole Turner pulls out on medical advice ”. Feedback on “'Exhausted' Keane finishes with another final as Nicole Turner pulls out on medical advice ”.